Preheat oven to 350°F. Grease and line four 7” (for taller layers) or 8? round pans. Begin by making the vanilla cake layers. Mix together all dry ingredients (flour, baking powder, sugar, and salt) in a stand mixer with a paddle until fully combined. Pour in egg whites, and mix on low until just incorporated. Mix in the buttermilk in two installments, on a low speed. Add in vanilla and oil, and mix at a low speed until fully incorporated. Scrape down the sides of the bowl with a spatula, then beat on medium speed for about 30 seconds. Using a spatula, carefully fold in sprinkles. Divide evenly between the prepared cake pans. Bake for 35-37 minutes if using 8 inch pans, or 37-38 minutes for 7 inch cake pans (or until a skewer comes out clean). Allow to cool for 10 minutes, then run an offset spatula around perimeter of the pan to separate the cake from the pan. Place cake layers on a rack to finish cooling, or in the freezer to accelerate the process. Once chilled, level the layers using a serrated knife. 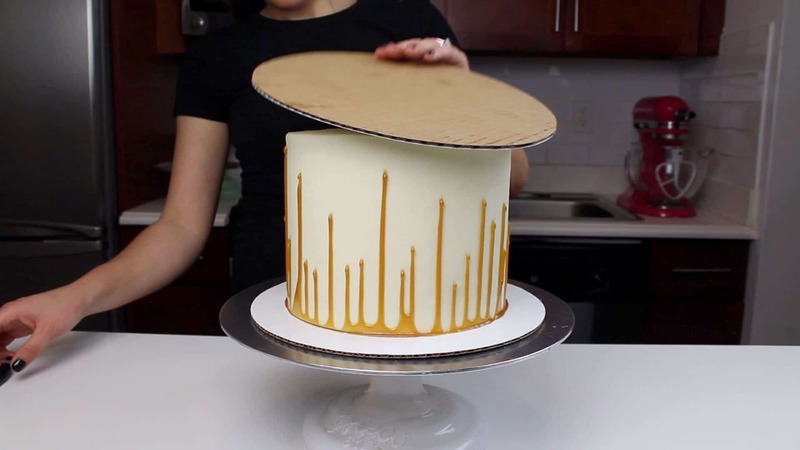 While the layers bake and cool, make the caramel! Turn stove onto medium heat, and place a pot over element. Pour in sugar. Using a heat proof stirring utensil (I use an old-fashioned wooden spoon), stir until sugar begins to melt into a clear liquid. Continue to stir, until clumps of sugar begin to form. Slowly the color of the sugar clump will deepen from white to amber. Keep stirring until all the clump of sugar have dissolved, and then turn off the heat. Mix in butter slowly, then stir in cream and salt. Place in fridge to cool for 20 minutes, then pour into desired container. I put mine in a squirt bottle, to make it easier to drizzle. Set aside. Next, prepare the buttercream frosting. Beat the butter on a medium speed for 30 seconds with a paddle attachment, until smooth. Slowly add in the powdered sugar, 1 cup at a time. Alternate with small splashes of cream. Once fully mixed, add in the vanilla and salt, and beat on low until the ingredients are fully incorporated, and the desired consistency is reached. If the frosting is too thick, add in cream (1 teaspoon at a time). If the frosting is too thin, add in more powdered sugar (quarter of a cup at a time). Place 1/3 of the frosting in a separate bowl, and add in 3/4 cup of caramel. Mix until fully incorporated. Stack and frost layers on a cardboard cake round, topped with an acetate sheet (optional, but it makes it way easier to flip to make the upside down drip). Frost an even layer of caramel buttercream between each cake layer, and add a generous drizzle of caramel. If desired, you can also sprinkle in some chopped caramel corn. 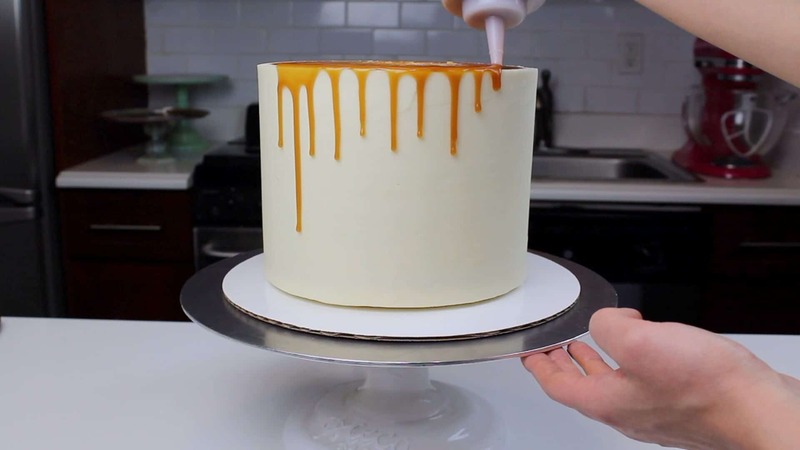 Cover the cake in a thin crumb coat with any remaining caramel frosting, and chill in the freezer or fridge for about 5 minutes. Once the crumb coat is firm to the touch, add a second layer of vanilla frosting. Smooth using a bench scraper. You can see a full tutorial on how to frost a cake with smooth sides here. 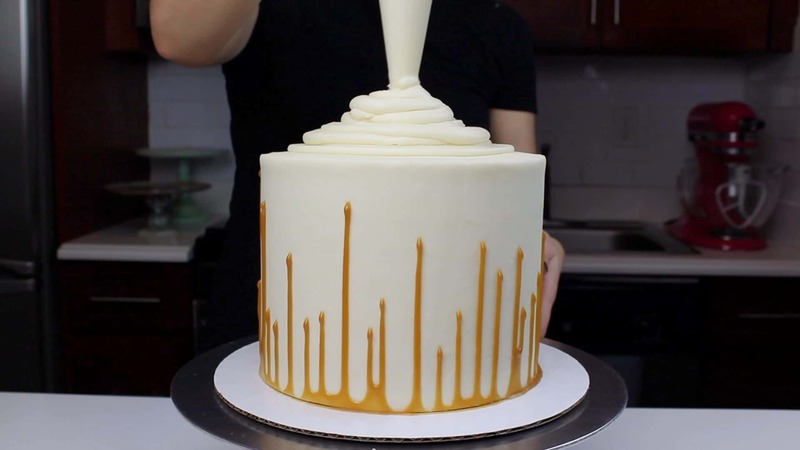 To make the upside down caramel drip, chill the cake for 30 minutes in the freezer (the cake needs to be VERY cold for the drips to stay in place). 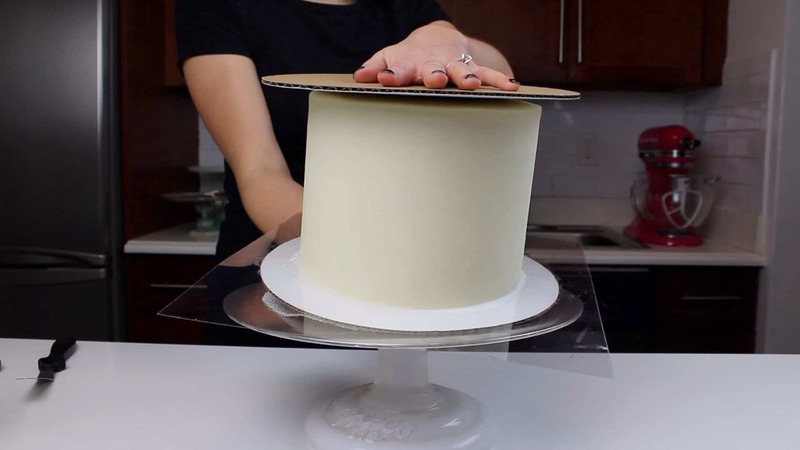 Use a second cardboard round, and carefully invert the cake. 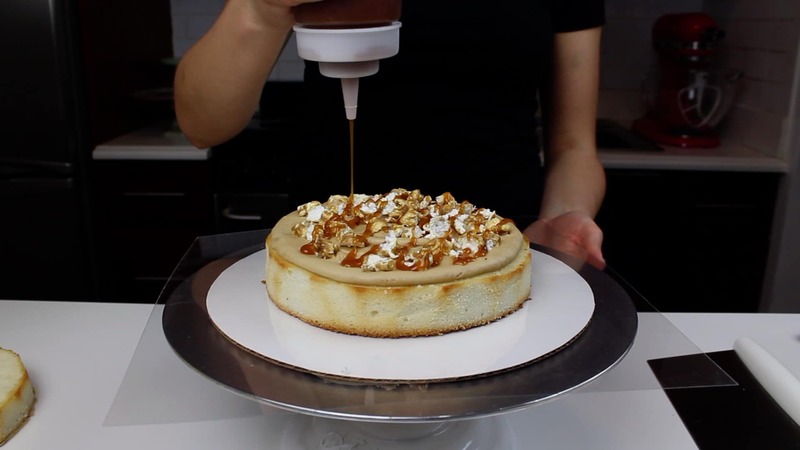 Gently peel off the acetate sheet, then add on the caramel drip. Always be sure to do a test drip, to ensure that your caramel is at the right temperature. Place the cake back in the freezer for another 30 minutes, to ensure the drips chill to keep them in place. Remove from the freezer, then flip back right side up. 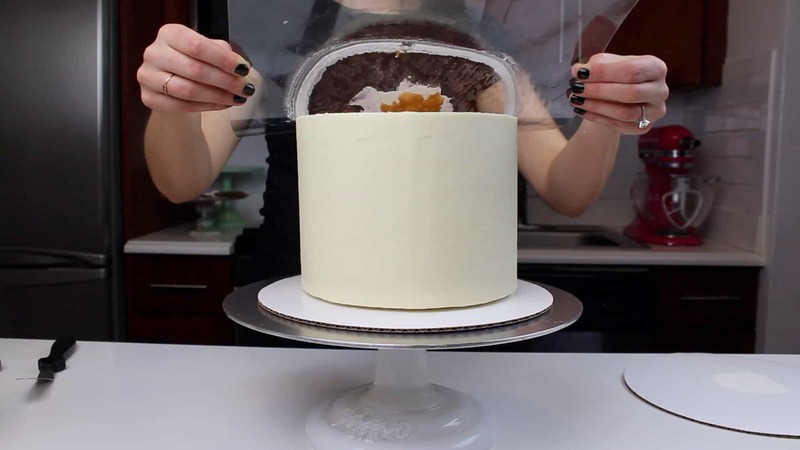 Use the remaining frosting to create a cone of frosting on top of the cake. 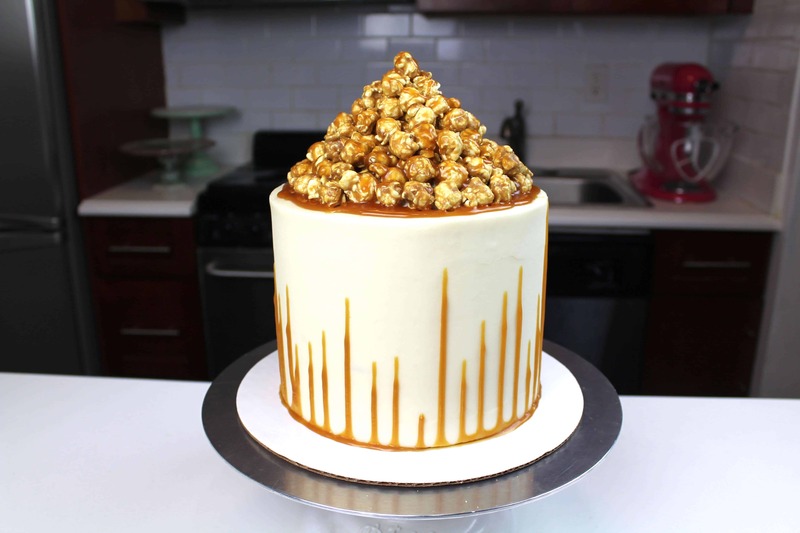 Carefully press caramel corn into the frosting, using extra caramel to help secure the pieces of popcorn in place. 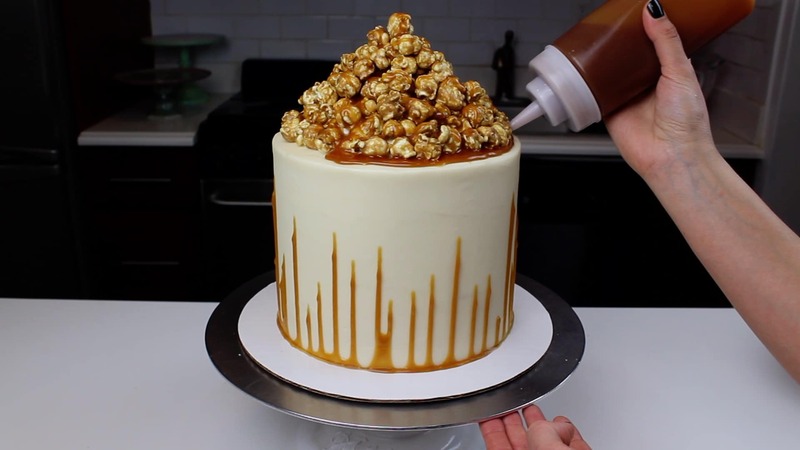 Add a final drizzle of caramel over the top of the popcorn, and a bit of extra caramel around the base of the popcorn pile. 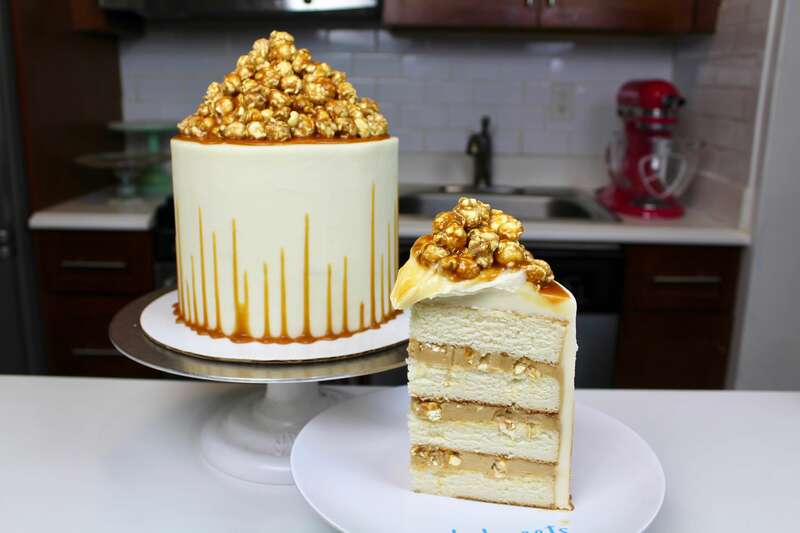 Then it’s time to cut into the cake, and enjoy all of that caramel!